A classroom can be a lot more than just four walls and rows of desks. Studies have shown the design and layout of the space in which students learn can heavily influence their performance in school and ultimately their academic success. Maha Barada presents three stories from around the world exploring the research behind this idea. We visit three exceptional classrooms that push the boundaries of traditional school architecture. The ground looks flat but we actually made it bumpy. If children run there they may fall. I believe it's OK for them to fall. When they fall once humans learn how not to fall the next time. This way they become strong. Japan: the world’s best kindergarten? Fuji Kindergarten in Tokyo is a pre-school like no other. The highly unusual circular design houses a host of surprises and innovations intended to enhance the childrens’ learning experience and foster a quest for knowledge. Created by renowned architect Takaharu Tezuka the building features a running track on the roof, trees that grow through the ceiling and floors intended to trip up the kids. Green is the colour if you want to get the most out of pupils in urban areas. That’s the conclusion of a study that says a learning environment featuring trees, plants and natural open spaces can boost a child’s cognitive development. The report, by academics including Dr. Marc Nieuwenhuijsen of the Centre for Research in Environmental Epidemiology in Barcelona says it can also enhance a young person’s memory capacity. In this story Dr Nieuwenhuijsen expands on the theory. 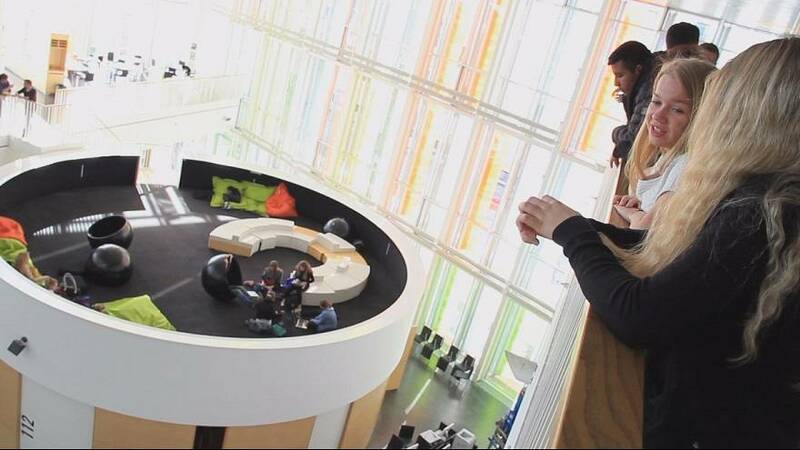 Blackboards, textbooks and even walls have been consigned to the past at the Ørestad Gymnasiun in Denmark. From the outside it looks like any other high school building, but inside it is anything but conventional. The central staircase is a meeting centre, open spaces serve as classrooms, even though noise drifts from one class drifts into another. The design is unique, intended to hone the students’ concentration skills. To see these stories in full click on the video.